What do the best blog sites do to get more readers? Successful blogs usually use WordPress, which is open source and one of the most popular blogging platforms. There is a small cost involved in paying for web hosting and a custom domain. There can be a bit of a learning curve with all the customization options and sometimes using professional web developers is necessary. 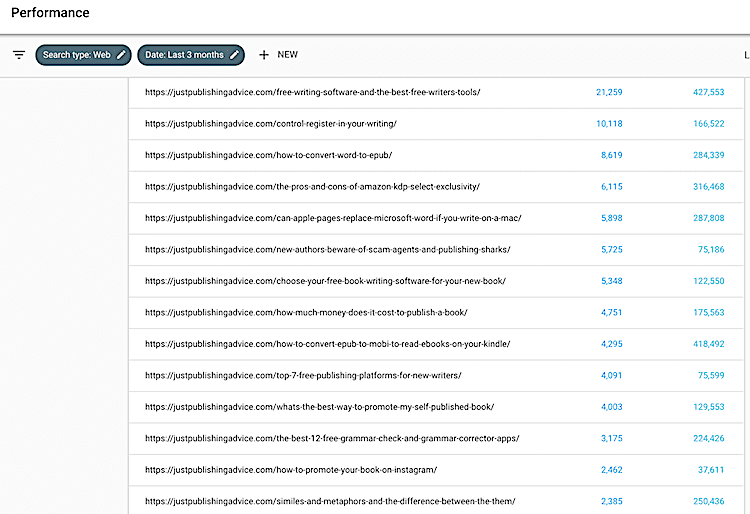 But if you are not in this league yet, you can still achieve some success with a free blogging platform. WordPress.com, which is the free version or WordPress hosts blogs on an advertising-supported platform is probably the best choice. The following guide is not meant for personal blogs and journals. But if you want to start a blog or you are currently building a blog to make money or to influence, these tips will help you. Key areas of improvement you can make to repurpose old posts. How can you improve your keywords? Your blog might not be income producing, but you would like to be an influencer on your topic. For any of these reasons, creating a popular blog and gaining more blog traffic will help you. But let’s be honest. You don’t have time to become an SEO (Search Engine Optimization) expert and wade through how to rank high for 200 Google ranking factors. I have read many times that 95% of blogs fail. While I can’t find a reliable source to prove this statement, I believe it could well be true. But it is so easy to rise above this 95 % of bloggers who don’t know how or can’t be bothered learning how easy it is to improve. If you want to rise above the rest, here are three not so secret, easy and relatively quick ways to improve your blog performance for your existing posts, as well as your new posts. Before you read any further, here are three performance graphs for my blog that show how I improved my blog ranking and traffic. I have used three simple techniques to achieve these results, which I will explain in detail shortly. The two Semrush graphs above are for Google traffic and keywords only. 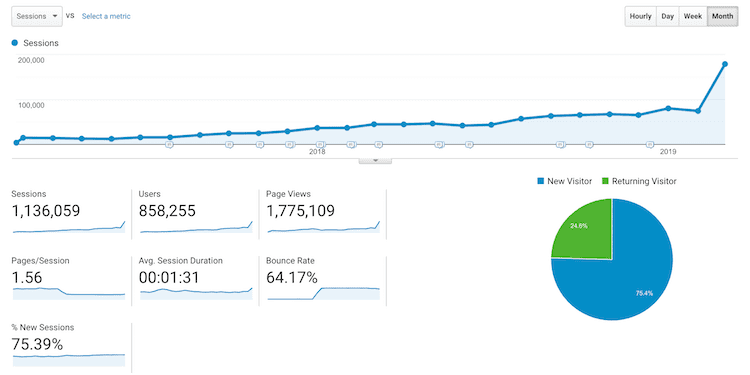 The traffic graph does not include user visits from Bing, Yahoo and other search engines. Nor does it include direct traffic, social media or referral traffic. But here is the graph of overall performance over the same period including all traffic sources from Google Analytics. The big blip at the end of the last graph is due to one recent blog post that went viral. Once this particular blog post loses a little heat, the blue line should return to an even upward trend. How did I get these results? By concentrating on the three most essential elements in blogging. Better blog content, improved SEO keywords and more internal links for old as well as new content. Search engines like Google are very intelligent now and can easily differentiate between a high-quality post and an average piece of content. The type of good blog content people love reading on the best blogs, and that search engines rank highly are the same. Creating great content comes in three basic categories. One is that you are answering a question. Two is that you are providing a solution. Three is that you are offering sound advice based on your experience. Poor content comes in three general categories. One is that you are only offering your opinion. Two is that you are writing about you and not to the reader. Three is that it is poorly written, with typos and errors, and is too short to be informative. If you take a look at your best-performing pages, you should notice that the top pages almost always fit into the first three positive categories. You can check this by using Google Search Console via your performance report. You can see that in my report they are mostly how-to and advice pages. Look at your top pages and see if you get a similar result. You can also download a report in spreadsheet format. By knowing what blog content is working for your blog, you are ready to improve on what is not working. On top of that, I create blog content that is much longer now. 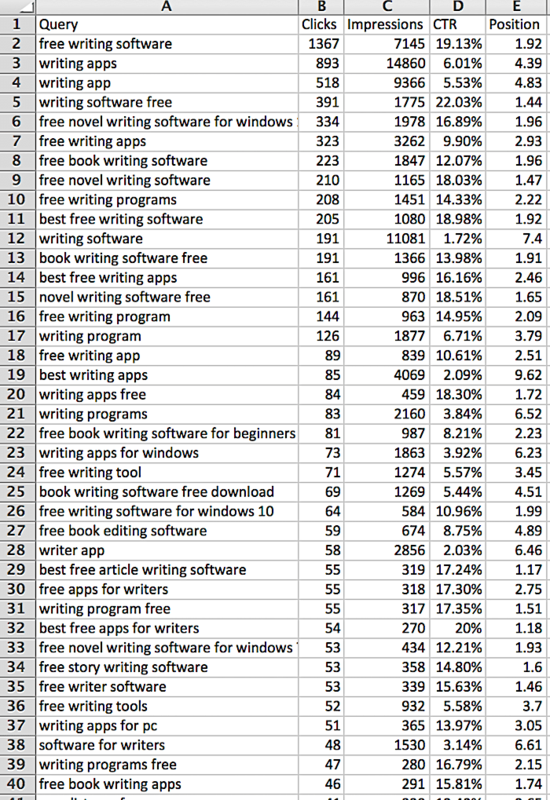 A blog post of between 1,000 and 2,500 words ranks much faster and higher and brings more traffic than three 600 word posts. Lastly, I have been repurposing my existing articles. Read on, before you start writing any new content. Even for the best blog sites, it is quite normal to get over 85% of its traffic from just a few of its top-ranking posts. But it means that there are a lot of blog posts that are getting very little or no traffic at all. You shouldn’t let this content marketing resource go to waste. All you need to do is improve and repurpose your posts so that they have a chance to start gaining more organic and social media traffic for you. It might sound like a lot of work, but it is a lot easier than you think. 1. Check your text and change any passive sentences into active. 2. Check that you are using the second person point of view so that you are talking to and not at your reader. 3. If your old post is a large chunk of text, break it up with some relevant images. 4. If a post is short, look for posts on the same topic and combine them into one new, longer form post. 5. Look for outdated information and update it. Case studies from 2009 are not going to be relevant to readers today. 6. When you find an old post that presents your opinion, modify it to offer advice to the reader. 7. Consider a new title. Use how to, what, when and where questions, as well as listicles, which also work very well. 8. Consider replacing or adding a stunning featured image to encourage social sharing by readers on their social networks. It won’t take you very long to improve your old articles. Even if you manage to update only a few articles each week, you will be making significant strides in making your blog work better for you. But also keep these eight factors in mind when you write a new post. Every blogger knows that a link earned from an external site will improve a blog page’s Google rank in search results. But these links are tough to get. However, do you know that internal links pointing to other blog posts on your site have a similar ranking value? Why agonise over trying to earn external links when you can quickly implement an internal linking strategy. You can so easily take control of your link juice (or link equity) and improve your ranking on search engines by adding internal links. 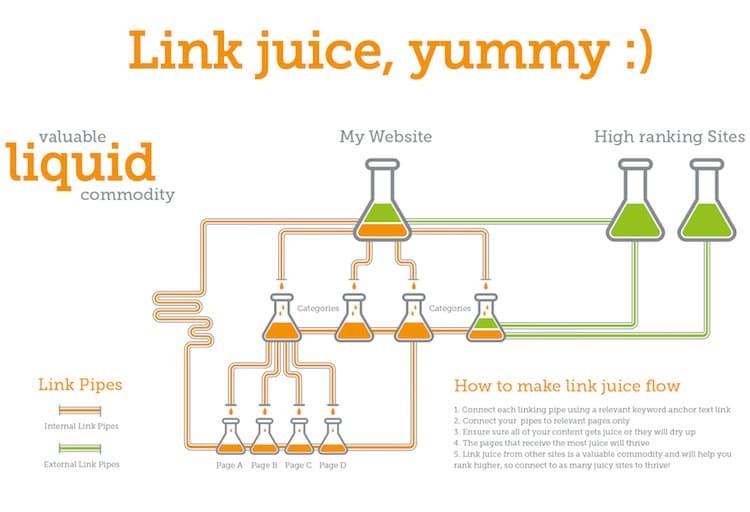 If you are still not sure how link juice works, here is a great infographic to help you from 5and3.co.uk. Your internal link structure offers so many benefits; it’s hard to know where to start. But I’ll try. These are usually a link to a page such as a contact page, category page or home page. While these pages might be important pages in your mind, they are not for an organic visitor. So they are not likely to be of much interest to a reader wanting to discover an answer to a question. But if your reader is interested in your article and wants to know more, you can use internal links to keep them on your site for much longer. These links point your reader to more of your posts on the same topic. You create internal links by using text links that optimize anchor text to stimulate interest. When you link to internal pages, you should never use click here or read more. You need to make sure that the text tells the reader exactly what they can expect to learn about from your internal link. If you are writing about Google Adsense in a post, you could point to the pros and cons of having advertising on your blog. The one golden rule of internal links is to only link to similar or complementary topics to help your reader. Also, limit the number of links to only the essential ones. Three or four is usually plenty in one long post of 1,000 words. If you cross topic your links, you will almost certainly lose your site visitor because you will be directing them to a subject that does not help answer their question. Internal links must be 100% relevant. When you are adding internal links, you should be adding links on your stronger pages to your weaker pages or to orphaned pages. As I mentioned before, you can download your top 1,000 pages from Google Search Console in a spreadsheet. You can then use it to judge where you plan to add and send your links. Another benefit of adding more internal links is that because they will be grouping your posts on similar topics, it will help Google and Bing understand your site much better. Adding internal links to all your posts is one of the quickest and easiest ways to improve your ranking and to generate much more traffic. Internal links are the fastest way, bar none, to boost your blog traffic. SEO keywords is a vast topic. So I won’t bore you with a 10,000-word essay. But the essence is that if you can get blog post keywords or a search term to rank in number one position on Google search, you will get approximately a 65-70% click-through rate of the search volume. Imagine if people are searching for the keyword phrase how to open a coconut. If you rank number one for this phrase, which has a search volume of 14,800 per month, you can expect to get around 9,000 visits per month. But if you rank in position number 50, you might be lucky to get one or two visits. 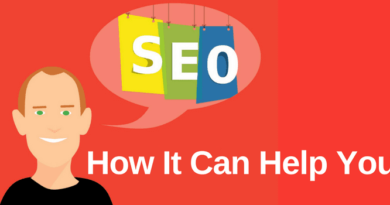 Finding keywords that have a relatively high volume and low keyword difficulty is what SEO is all about. But you need to spend a lot of time using tools such as the Google Adwords keyword planner or investing in professional SEO research tools. A better strategy, if you are trying to improve your blog, is to look into the specific keywords that your site is already ranking for and try to improve on them. Again, Google Search Console (GSC) can help you. Firstly, download a report of your top 1,000 keywords. Here is an example from my site. I have cropped the image above because it is too long. But you can see that from the table it is easy to see which long tail keywords are ranking highly and bringing the most traffic to my blog posts. However, the table above does not give the specific keywords for which each page is ranking. You can do this by selecting Pages in GSC, then click on one page, then click on Queries. Now download your spreadsheet. If you are not sure how to do this, watch this quick video. Now that you have the top keywords for a single page, there is some real data you can work with to improve your ranking with search engines. These are keywords that are just outside certain ranges. Any keywords that are ranking at number two are prime candidates you want to improve to try and get the number one ranking. Ones that are ranking at number four are also worth improving because positions 1-3 get 90% of the search traffic. Number four only gets around 4-5%. Another bubble is number 11. 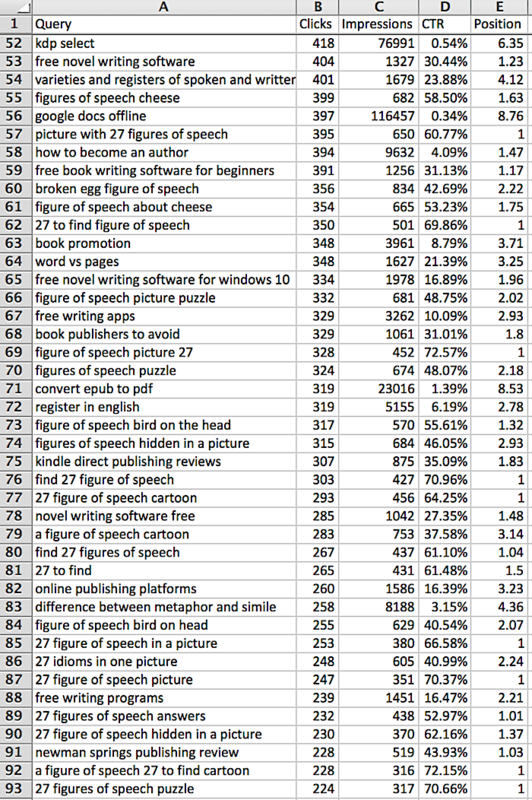 The top ten search results get 99% of search traffic. So at number 11, you are as good as lost. It’s quite easy. Once you have identified the keyword and the page, you need to improve your blog post a little. First, check if the targeting keywords appear in your body text. If yot, add it once or twice. Make sure it is exactly the same. Then look at your title tag and meta description. Is the keyword there? If not, add it. Now your post is keyword optimized or at least improved. Lastly, look at your content. Can you extend or expand on any points that might be more relevant for your chosen keyword? Adding an extra 200 words that are about your keyword will help a lot. You don’t need to add new keywords into your blog posts. You only need to improve on the ones that are already ranking and work to get them to rank better and higher. Lastly, see if you have a related stronger page or two that you can add internal links pointing to your improved page. It is easy to work on improving your keyword performance. It can take as little as 10-15 minutes per blog post and then you can expect to get more traffic as a result. Your blog is a digital marketing tool. The more you can hone it, the better it will work for you. When you create content, think about the three topics covered in this article. Content, internal links and keywords. If you get all three right and working together, you will succeed in enhancing your content marketing. But instead of trying to produce a lot of new content for your blog, investing your time in improving and updating your existing content can have much faster results. The three graphs at the beginning of this article are the product of improving old content more than adding new content over the last year or so. 1. Edit or re-write your old articles to use the second person and talk to your readers and offer advice or answer questions, rather than express your opinions. 2. Combine short posts on the same topic into one much longer post. 3. Use internal links to send link juice from your stronger pages to your weaker pages. 4. Improve your bubble keywords to increase your website traffic. Are you ready to get to work for the same results for your blog? I am sure you are already onto it. Derek, I have to say that I detest very long blog posts. Why do they have to be so long? My eyes begin to glaze over after a while, unless the subject is very compelling.